Designer Applied Labels™ - Waterproof sticky labels. 1.5" x 0.5". Designer Iron-Ons - Ultra performance iron-ons for socks, underwear and tagless t-shirts. 1.5" x 0.5". Our camp packs include labels that are personalized, ultra-durable and commercial dishwasher and laundry safe. 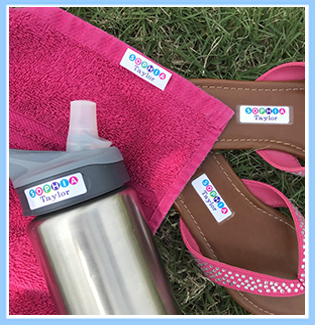 The labels work on everything from water bottles to clothes to shoes. Iron-Ons are included for items without tags such as underwear and socks. Iron-Ons: Place label text side up on the fabric. *i.e., phone number or email. The layout of your label will vary based on your design and text selections.